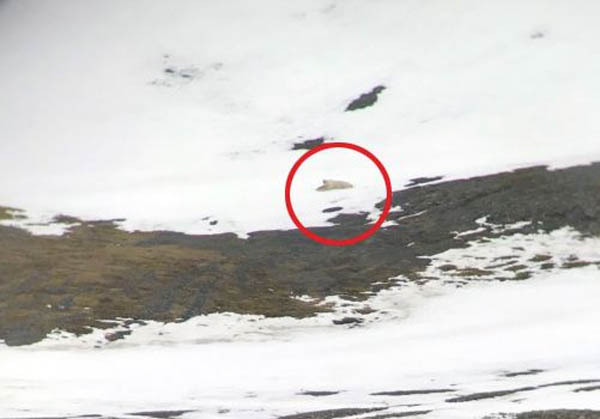 A polar bear spotted near Longyearbyen late Tuesday night wandered away from town a few hours later, but officials are continuing to monitor the area in case the animal returns, police said Wednesday. The Governor of Svalbard was notified about the bear at about 11:15 p.m. Tuesday when it passed Hiorthhamn. It continued over Isdamm, took a break at Bayfjellnosa and disappeared from sight into Todalen. “If it had swung the other way and walked towards the dog kennels we would have tried to scare it,” said Police Chief Lt. Bjørn Pedersen. “But since it went the other way we did nothing.” He said police were concerned the bear might try to return to town. “We watched through the night at the inlet of Todalen. We did that because bears can quickly change direction when they’re wandering like that.” Officials are considering using a helicopter on Wednesday to determine the bear’s location. The medical rescue of a person aboard a Russian trawler Monday required a lengthy round-trip flight by one of The Governor of Svalbard’s rescue helicopters, flying two-and-a-half hours each way and refueling at the meteorological station on the southern island. The governor’s office was notified about the emergency at about 8:40 a.m. and the helicopter departed at 9:30 a.m. “The whole flight goes over the sea, so it faces challenges,” said Police Chief Lt. Lisbeth Hansen. The patient was retrieved and the helicopter refueled before returning to Longyearbyen, where the patient was treated before being sent to a hospital in Tromsø. Hansen said such long flights occur relatively often due to the large distances between areas where activities occur in Svalbard.